The lion’s share of our transit-oriented program this week has centered on the personal car and its infrastructure. This is no accident. The car speeds, stalls, thrills and kills us — all because we need a ride. But what if we’d really rather journey by bus? Brooke spoke with Kafui Attoh, professor of urban studies at the CUNY Graduate Center, about the deep political connotations of “transit rights.” Such rights, Attoh argues in his forthcoming book Rights in Transit, have roots in Marx, Engels and Lefebvre’s thinking on the radical nature of cities. Listen to the whole hour here or check out Prof. Attoh’s segment here. New Labor Forum’s September 2018 print issue is rolling off the press now. It contains as good a reason as there is to subscribe now: thoughtful analysis and lucid writing on a wide range of issues vital to anyone who cares about the prospects of workers and working-class communities in the U.S. and throughout the world. Articles in the new issue: assess the options available to blue collar women and female care workers seeking to combat sexual harassment; ask if there is a deep state and what interests it serves; argue that the labor of Palestinians in building the Israeli nation magnifies their claim for full citizenship rights; and trace the remarkable rise of Jeremy Corbyn, once a marginal figure, held in contempt by UK Labour Party elites, now leader of the party and with a chance to lead the country. On this Labor Day, we highlight two proposals to organized labor. In the first, Larry Cohen argues for a new national system of collective bargaining, modeled on the sectoral bargaining that sets industry-wide wages and working conditions for workers from Norway to South Africa. Moshe Marvit and Shaun Richman make the case for new “Right to Your Job” legislation that would end our “at will” employment regime and force employers to prove that terminations are related to work-performance. Because this legislation stands a fair chance of passing in a number of municipal and state legislatures, Marvit and Richman insists it should become a policy priority for organized labor and its allies. 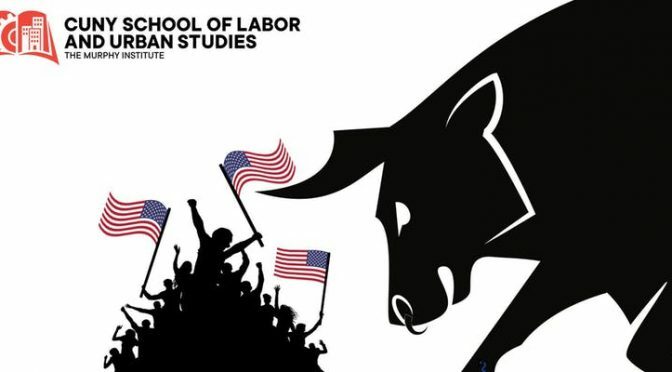 And we announce that the CUNY Board of Trustees has voted to establish the Murphy Institute, publisher of New Labor Forum, as the new CUNY School of Labor and Urban Studies. The School’s inaugural round of fall public programming, begins with a public forum on September 14th, entitled A Failing Marriage: Democracy & Capitalism. Inequality is accelerating at an alarming rate as corporate political power is expanding and worker rights and protections are shrinking. The hyper concentration of wealth in the hands of a financial elite has come to dominate politics and shape policy in a manner that has eroded democratic governance at the federal, state, and the municipal levels. Can democracy be saved from the grips of capitalism? What factors most threaten meaningful civic engagement and what changes are needed to bolster our democracy and create a more equitable society? Update: missed the event and want to watch it online? Catch the video here. In light of the Supreme Court’s decision to hear Gill v. Whitford, this panel will explore the history of gerrymandering and the effects of recent changes in technology, data mining, and dark money, to understand the implications of potential Supreme Court decisions. Before this case made it to the Supreme Court, what work had been taking place on the ground to address the effects of gerrymandering? How has the US Census influenced redistricting? What can we expect from the Supreme Court and how will this impact the future of electoral politics? With contributions from a New York City social movement delegation currently in Spain ahead of the country’s local elections on May 24th, which includes JSMI Part-Time Staff Member Tamara Shapiro. You can follow their trip on Twitter at @NYCtoSpain, and NYC to Spain on Facebook. This article originally appeared on Medium.com.